This article examines how UV protection is tested in polyethylene, especially as it applies to meeting the Australian standard for polyethylene tanks and leading Rotathene® “SUPA UV” technology. UV protection levels in rotomoulding grades of polyethylene (PE) are assessed under highly controlled conditions. Tests involve subjecting PE samples to high intensity UV radiation with similar wavelengths that come from the Sun. Temperature is also factored in since it can affect additive consumption and polymer degradation. A number of sets of identical non-colour pigmented PE samples are prepared. All but one set is placed in a UV weatherometer test chamber. Samples in the UV weatherometer are irradiated with UV over 1000s of hours. Samples are removed from the UV weatherometer every few 1000 hours and stretched in a tensile tester to determine how much they can still stretch. This provides what is called the % Elongation of the test sample. The Elongation value is compared to the value obtained for the set that was not placed in the weatherometer and recorded on a graph as the % Retained Elongation. The process is repeated, and once the retained Elongation drops to 50%, the PE integrity is deemed by the Rotomoulding industry to have failed. Because PE becomes brittle as it degrades, its ability to stretch declines and thus the % Retained Elongation decreases as degradation increases. The Australian standard for poly tanks, AS/NZS 4766:2006 Polyethylene storage tanks for water and chemicals, specifies a minimum UV8 level of stabilisation for good long term protection in Australia. UV8 represents the time taken in 1000s of hours to reach a point of degradation that is deemed in the rotomoulding industry to be failure. A PE grade that takes 8000 hours of intense UV radiation to drop to 50% of the value for its original unexposed samples, is said to have a UV8 level of protection. A test sample fails once the Elongation drops to 50% of the value for the original PE sample that was not exposed to UV. This is often when polyethylene loses so much elasticity that it becomes brittle. Different pigments added to the polymer mix can affect the UV protection of a poly tank. 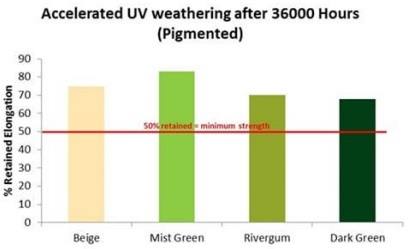 Accelerated UV weathering applied to SUPA UV polyethylene samples show that even after 36,000 hours, some pigmented samples retain over 80% Elongation. 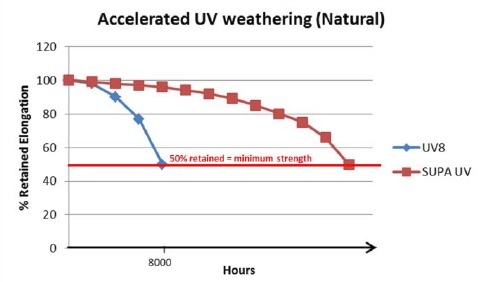 For many years a UV stabilisation level of UV8 has been the Australian standard for what performs well for poly tanks placed under the Sun. SUPA UV goes well a truly beyond this standard, affording Australian tank owners the highest levels of UV protection in poly tanks. All Team Poly tanks are made from leading Rotathene® SUPA UV technology to ensure they provide maximum protection against Australia’s harmful Sun.